American-made in West Bend, Wisconsin, our cast aluminum cookware is designed and built from premium grade aluminum for the most responsive cooking performance. 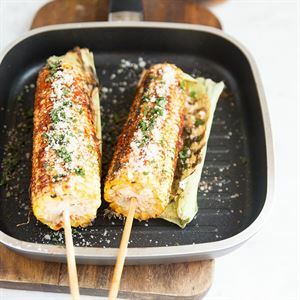 Known for its versatility, durability and ease of use, our hand-poured cast aluminum also has nonstick coating for easy clean up and quick release. Whether you are hunting for the perfect dutch oven for savory, slow and low meals, or a square roaster for group casseroles, side dishes and more, our cast aluminum collection is ready to serve. To cast, is to heat metal until it is molten, subsequently pouring the liquid metal into a gravity-fed mold. Once the metal has cooled and the mold has been removed, the resulting seamless, solid piece is the cast. The result is lightweight cookware that costs less than cast iron and won't corrode. Each American Kitchen Cookware cast aluminum piece is individually hand-finished, with comfortable and ergonomic handles and knobs added. It is this individual attention that creates pieces both functional and extraordinarily beautiful. Aluminum, a commonly used food-safe metal and the second most used metal in food service, is central to our popular cast aluminum cookware line. Less expensive than its cast iron counterpart, cast aluminum cookware is widely beloved. It is lightweight, reducing strain on those who rack up hours in the kitchen. Cast aluminum can heat up and cool down rapidly, enabling chefs to re-use, clean and clear pans efficiently. It’s anticorrosive - since there is no carbon in the metal, the surfaces will not rust. It distributes heat evenly - lack of hot spots allows for consistent and predictable work surfaces at all levels of heat, a must in all kitchens. With proper care, American Kitchen Cookware’s cast aluminum collection will retain both function and patina for years. 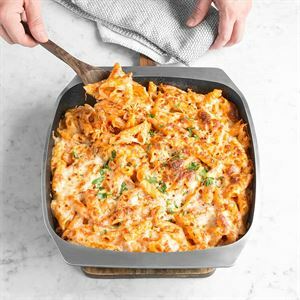 A PFOA-free Eterna® coated non-stick surface encourages easy food release while cooking, and our pieces are dishwasher safe, making clean-up a simple affair. 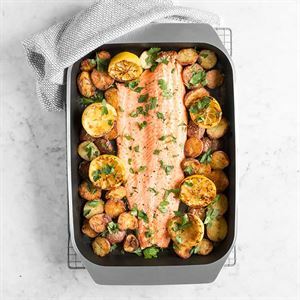 Extremely durable, our nonstick coated pans can even be transferred from stove to oven for maximum cooking versatility. Our tempered glass lids are likewise oven safe, and our heat-resistant ergonomic handles and knobs remain cool to the touch. Simple usage suggestions, found in our Cast Aluminum Use and Care guide, will help keep your favorite pots and pans in top working order. Mix local craftsmanship, reliable performance and American Kitchen Cookware’s attention to detail with your love of good food, and find your perfect recipe within our cast aluminum cookware, stainless steel cookware and nonstick cookware collections.